Posted on 30 January 2014 | Comments Off on Understanding the original distribution and abundance of fish fauna in the Murray-Darling Basin. The identification and protection of drought refuges for native fish in the Murray-Darling Basin. Posted on 30 January 2014 | Comments Off on The identification and protection of drought refuges for native fish in the Murray-Darling Basin. 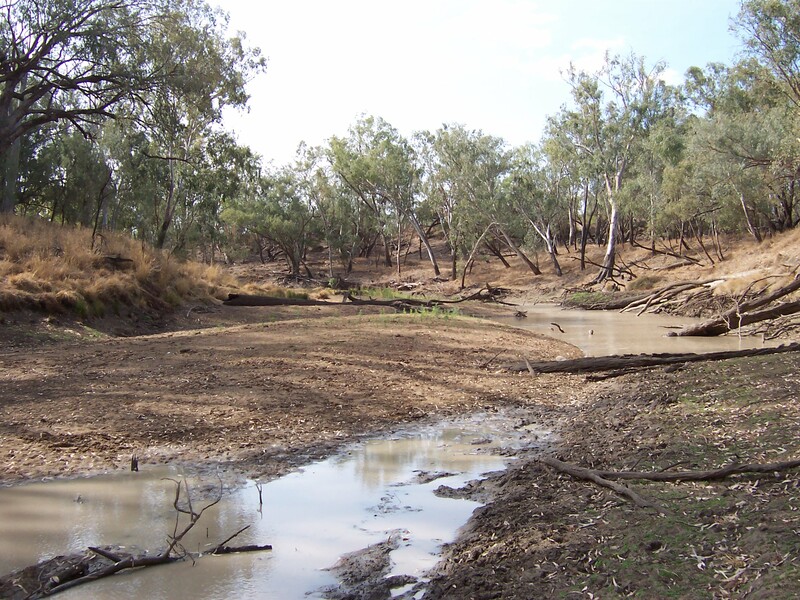 Threats and Impacts: From 1996 to 2009, the Murray-Darling Basin (MDB) experienced severe drought conditions. As the impacts of the drought worsened, the need for improved and co-ordinated management responses became increasingly important to protect key ecological assets and critical aquatic habitats and ecosystems. Within the MDB it was uncertain whether an adequate network of drought refuges (e.g. flowing perennial river reaches, deep waterholes) remained to preserve native fish species/populations through extended drought. This project was established to address this knowledge gap. develop guidelines and an approach to identify, prioritise and protect drought refuges for native fish that can be implemented across the MDB. Methods: The current status and management of refuges were explored using a number of techniques including questionnaires, an expert/management workshop and a review of relevant literature and management programs. This process identified the types of habitats that serve as drought refuges across the MDB, the key native fish species that have been targeted for protection under drought response programs, key threats and the current management responses/actions undertaken for refuge protection. In order to catalogue refuge sites, a preliminary list of critical sites was developed in collaboration with managers and experts. An approach to identify and protect refuges was developed in conjunction with regional agencies and jurisdictions from two pilot valleys: the Goulburn Broken catchment in northern Victoria and the Moonie catchment in south-eastern Queensland. Under this phase of the project, definitions and criteria for identifying and prioritising refuges were developed in conjunction with management agencies. A management tool was developed for collating refuge values and habitat attributes, as well as threats to the maintenance and improvement of these important characteristics. This approach may be used for the prioritisation of interventions based on key management principles, including: threatened species, protection of habitat biodiversity, water allocation, catchment management actions, fisheries management actions and restoration. Based on the information elicited from the pilot valley analyses, a template was produced to assist in refuge identification and management across the MDB. This template documents a process that can be integrated into regional natural resource management frameworks across the MDB, acknowledging that different states and regions are subject to various legislative and policy environments and possesses varying levels of information, data, planning structures and intervention opportunities that relate to aquatic habitat protection. Findings: A wide range of aquatic habitats were considered important as drought refuges, with unregulated waterways the most commonly identified habitat type, and of the greatest concern to managers. In some instances, key native fish species were used to identify particular drought refuges. The protection and/or management of the refuges for these species either followed a ‘single species’ approach (more common in the drier, southern MDB) or ‘multi-species/community’ approach (more common in the northern MDB). Refuges were defined and identified at larger spatial scales in the northern MDB and at smaller, site-specific scales in the southern MDB. The reason for these different approaches reflects the varying intensity of drought impacts across the MDB. These different approaches to the management and protection of drought refuges reflect the different aspects of native fish ecology, in terms of resistance versus resilience. This study concluded that a holistic approach to drought management was required with drought refuge protection plans incorporating enough flexibility to identify and invest in emergency short-term responses during peak drought periods as well as having guidelines in place aimed at broader scales to promote long-term resilience in native fish populations. Lessons learned and future directions: This study has reinforced that priority areas which act as drought refuges require adequate management to ensure the long term survival of native fish populations. This study identified the two scales at which drought management operates and the strengths of each scale to address both short and long-term impacts of drought on native fish and their habitats. This information will ultimately lead to better drought management regarding native fish and their habitats, which will minimise the risk of loss of native fish species and populations and preserve native fish habitats. Comments Off on The identification and protection of drought refuges for native fish in the Murray-Darling Basin. A number of fishways have been constructed under the auspices of the NFS to help reinstate passage of fish past a number of barriers in the Murray-Darling Basin (MDB). Because it is too expensive to continuously trap fishways to gather information on migratory behaviour, using an electronic monitoring unit to continuously monitor fish migrations is an attractive option for monitoring fish movement and fishway effectiveness. The Vaki Riverwatcher technology has been successfully used in Northern Hemisphere rivers to count and measure the size, date and shapes of fish which pass through an infrared scanner. Prior to this project, this technology had not been trialled on Australian rivers and species to evaluate utility for monitoring purposes. 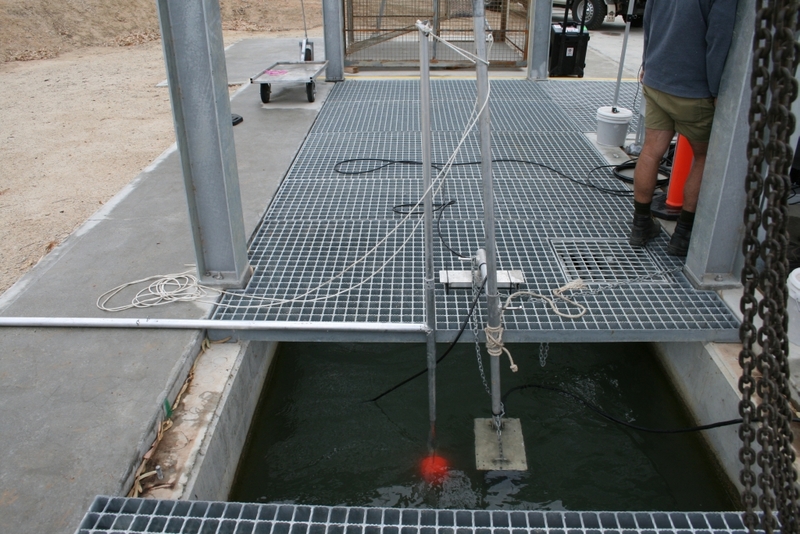 Broad aim and specific objectives: This study aimed to perform a field study on the effectiveness of an infrared fish counter, the Vaki Riverwatcher in anticipation of wider application throughout the Murray-Darling Basin. The limitations and advantages of the system were fully explored in both controlled and field environments. 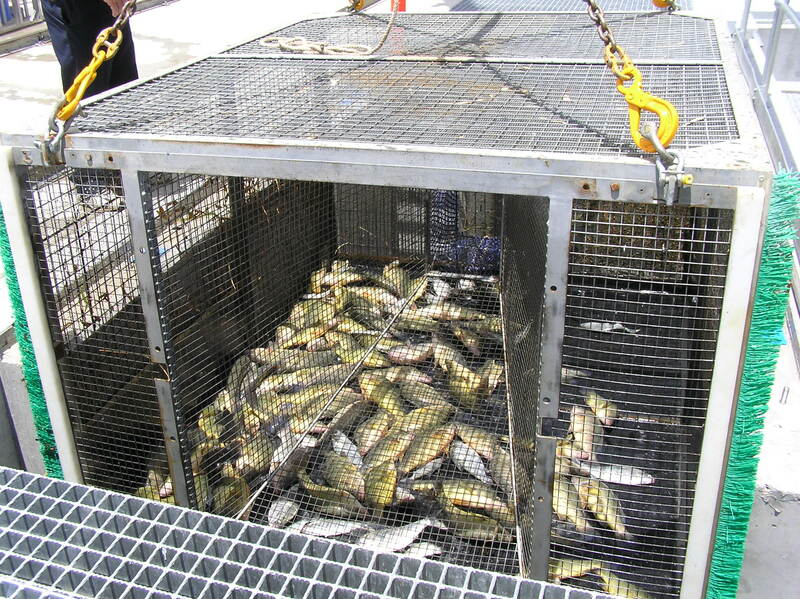 determine how fish behave in relation to an infrared fish counter and fish trap. Methods: Laboratory trials were undertaken to determine the ability of the Riverwatcher (Figs 1-3) to cope with different turbidity and fish migration rates. Silver Perch (Bidyanus bidyanus) were passed through the unit under a range of turbidity between 0 and 100 Nephelometric turbidity units (NTU). 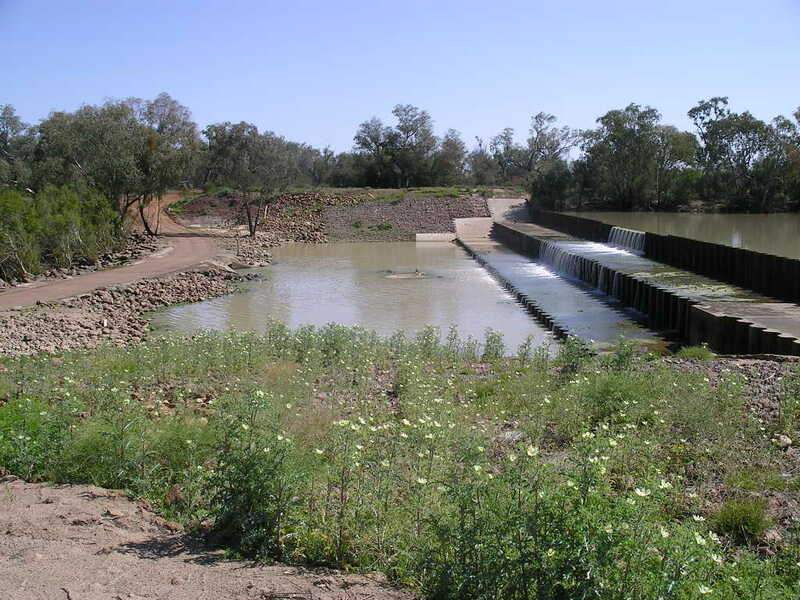 Field trials were undertaken at Lock 10, on the Murray River (near Wentworth), which had been retro-fitted with a vertical slot fishway in 2006. The unit was used in conjunction with a DIDSON sonar unit and a standard fish trap, to assess the ability of the Riverwatcher to distinguish different species, count migrating fish, estimate the size of migratory fish and to assess fish behaviour in and around the unit. Field trials were also performed to test the Vaki Riverwatcher system under river conditions. The unit was used in conjunction with other electronic monitoring gear, and also fish traps, to assess the ability of the Riverwatcher to distinguish different species, count migrating fish, estimate the size of migratory fish and to assess fish behaviour in and around the unit. Findings: The Riverwatcher performed well and counted hundreds of migrating fish. Fish counts from the unit roughly corresponded with those caught within a fish trap upstream of the unit. However, the unit tended to underestimate fish size and some fish avoided contact with the unit. Experimental trials on the impacts of turbidity on the Riverwatcher revealed that the unit generally overestimated fish counts during low turbidity but underestimated during high turbidity. It was also difficult to identify fish that actively avoiding passage through the unit. Lessons learned and future directions: The Riverwatcher unit provided a powerful mechanism to monitor fish movement but often underestimated fish numbers and lengths which detracted from the quality of the hardware. If these limitations are overcome, or at least quantified, the unit would represent a cost effective mechanism to count and measure migrating fish. The unit has a range of potential applications including within fishways, at floodplain regulators, within supply channels or other points of suspected fish movement. It is flexible in terms of operation, but is limited by the restricted width of the scanner unit. Where width or depth is an issue, additional scanner units can be linked together to create an array which can give wider spatial coverage of the target area. Provided the site of application is a known point of fish movement, obtaining count and size data on migrants would be possible and should be considered for a long-term deployment at a key site of fish migration in the Basin. Additional trials would help to determine if the gear is suitable for determining trends in fish movement over a longer time period. Recent ecological research at the landscape scale suggests that there may be key locations, or “hotspots”, that play a disproportionate role in sustaining species and ecological communities. The identification of native fish “hotspots’ in the Murray-Darling Basin (MDB) would greatly assist managers in protecting biodiversity and maintaining important ecological processes for native fishes. 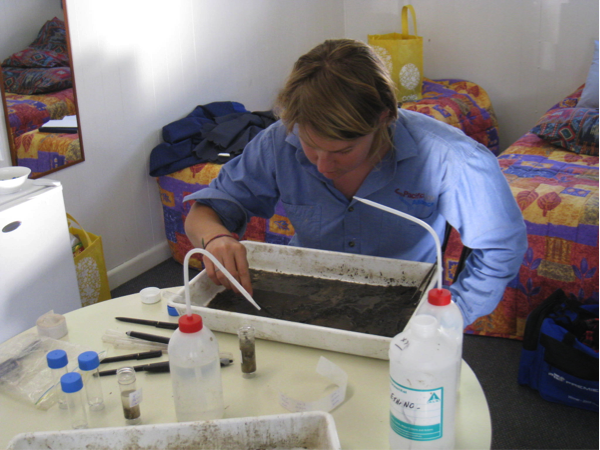 provide a template for similar studies to be undertaken on other fish species in the Basin. explore the management applicability and use of MDB hotspots for native fish. using this methodology and data availability to develop an appropriate study design which could be used in Stage II of the of the project to identify ‘hotspots’ across the MDB that are significant for native fish. Findings: The study mainly focussed on four high priority native fish species; Murray Cod (Macculochella peelii), Silver Perch (Bidyanus bidyanus), Golden Perch (Macquaria ambigua) and Freshwater Catfish (Tandanus tandanus), though some consideration was also given to some other species of conservation concern. The study defined a “hotspot” as being “areas within riverscapes that have extraordinary importance for fish or processes that sustain native fish populations”. The study highlighted the importance of understanding the processes underlying hotspots in order to maximise the efficiency of management actions and conservation measures to ensure cost-effective return on interventions. To achieve this, a suite of suitable metrics were developed which encompassed both direct measures of fish and measures of the ecological drivers supporting them for each of the priority species and communities. The study concluded that insufficient data currently exists to adequately identify hotspots across the MDB. However, this project provided an approach and suitable methods to collect relevant data that could then be used with current data to determine and describe hotspots in the MDB. It was recommended that the next step should be to investigate large-scale patterns in focus species abundance using existing datasets, determine the applicability of the hotspots concept for all metrics in a subset of river valleys, then expand on observed trends to other valleys to identify hotspots throughout the MDB. 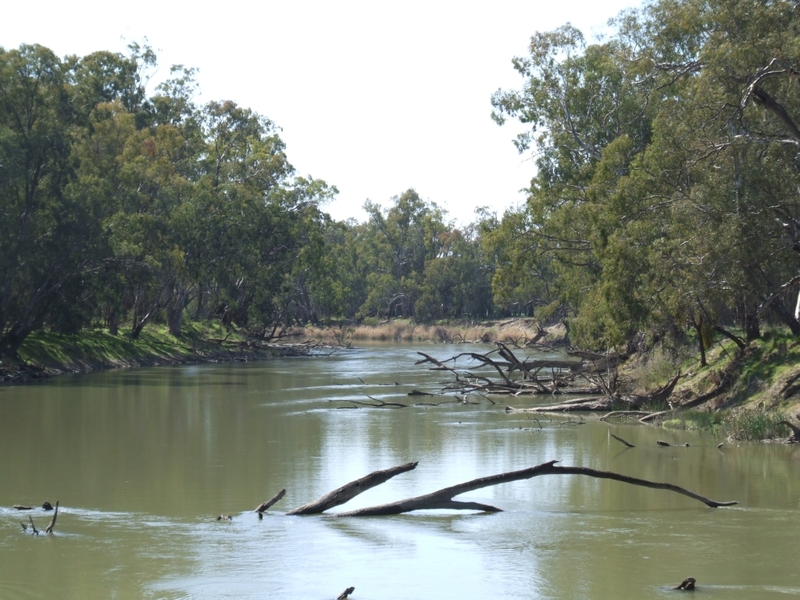 The identification of “hotspots’ in the Murray-Darling Basin (MDB) would greatly assist managers in protecting biodiversity and maintaining important ecological processes for native fishes. This study provides a pathway by which to engage the next step in the process of validating the hotspot concept in the MDB. This will identify critically important habitat required for protecting or rehabilitation to support priority native fish species. Contacts: Zeb Tonkin, South Australian Research and Development Institute. Tel: + 61 3 9450 8600, Email: zeb.tonkin@depi.vic.gov.au. Behavioural aggression in Gambusia holbrooki is conditional upon temperature and relative abundance. Posted on 29 January 2014 | Comments Off on Behavioural aggression in Gambusia holbrooki is conditional upon temperature and relative abundance. Key words: Eastern Gambusia, aggression, pest fish, Native Fish Strategy. Threats and Impacts: Introduced to Australia in 1925 as a potential mosquito control agent, the fish Gambusia (Gambusia holbrooki) (Figs 1 and 2) is now present in almost every major Australian drainage, including the Murray-Darling Basin. Gambusia are extremely aggressive, harassing, predating and attacking native fish; and are thought to also pose a significant threat to many amphibians and invertebrates. Broad aim, specific objectives and methods: This project explored in aquaria how aggressiveness of Gambusia changed according to the relative abundance of two native fish species (western carp gudgeon Hypseleotris spp. and juvenile Golden Perch Macquaria ambigua). 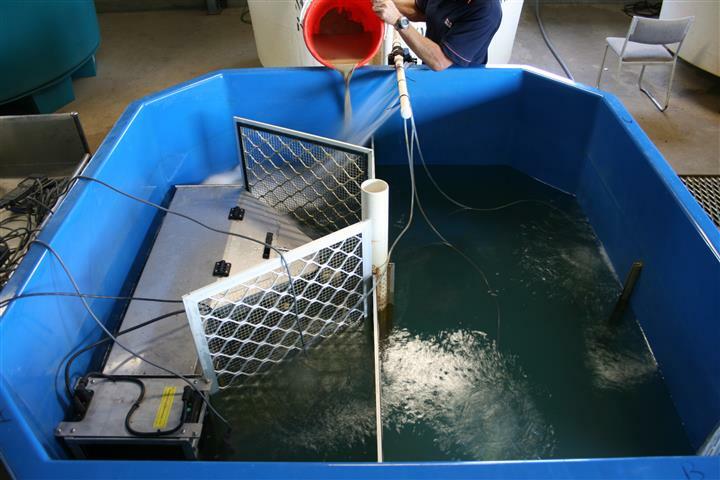 Five treatments were run involving combination of Gambusia to native fish ratios and temperatures. The project was designed to improve understanding of how Gambusia might behave when it colonises new areas and how behavioural responses might be affected by efforts to control their numbers. Findings: The study found that Gambusia were highly aggressive towards both species of native fish and that aggressiveness increased when Gambusia were outnumbered by native fish. The study also found that the type of aggressive behaviour by Gambusia (e.g. biting or chasing) was specific to the native species it was interacting with. Gambusia were shown to dominate the available habitat within the tank very shortly after introduction. 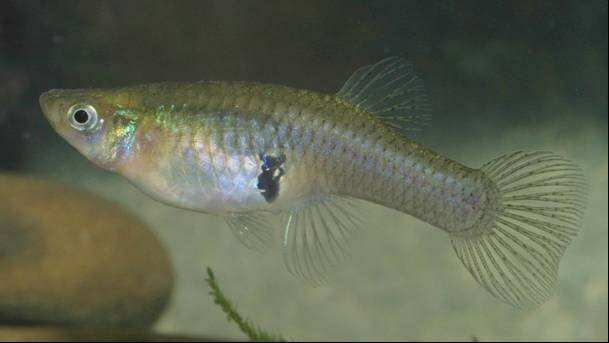 The high aggression and dominance behaviour exhibited by Gambusia when outnumbered assist this species when invading new habitats and may also have implications for eradication efforts aimed at this invasive species. 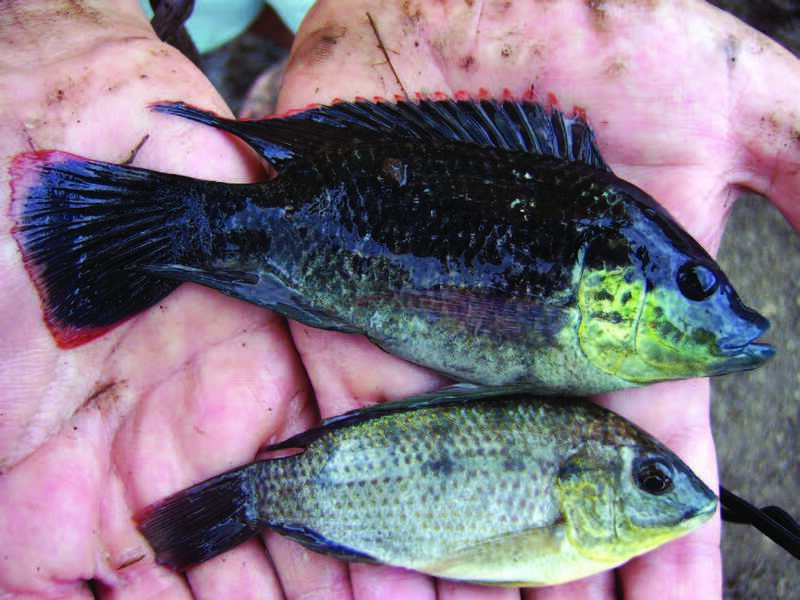 Lessons learned and future directions: The increased aggression by Gambusia when outnumbered potentially means that control efforts that reduce the abundance of Gambusia but don’t fully eradicate them may not be beneficial to native fish in some cases. 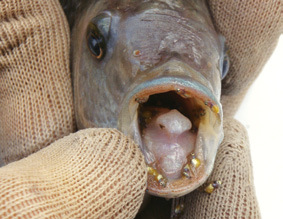 The research suggested that aggressive interactions from Gambusia may not decrease as a result of eradication efforts. Contacts: Dr Andy Moore, Department of Agriculture Fisheries and Forestry. Tel: + 61 2 6272 3090, Email: anthony.moore@daff.gov.au. Comments Off on Behavioural aggression in Gambusia holbrooki is conditional upon temperature and relative abundance. Threats and Impacts: Barriers to migration have been identified as a major contributor to the decline of native fish species within the Murray-Darling Basin. The Murray-Darling Basin Authority have made significant investment in improving fish passage along the Murray River and associated anabranches through the Lake Hume to the Sea program and the Living Murray Initiative. Despite the improvements along the Murray River, this investment has not been matched in the Northern Murray-Darling Basin. 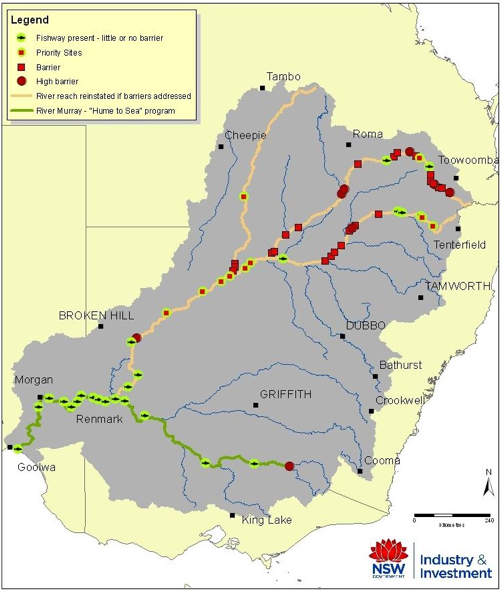 At present, the movement of fish within and between river systems north of Menindee Lakes remains significantly restricted by dams and weirs without adequate fish passage. Broad aim and methods: This project set out to develop concept designs and engineering costings for the highest priority weirs in the Northern Murray-Darling Basin. A review of literature was undertaken initially to assess the likely composition and migratory requirements of the fish fauna in the Northern Basin. An analysis of available options for fish passage was undertaken, and justification provided for the preferred options in terms of the ecological, hydraulic and technical design constraints associated with each weir. Assessment of structures within the northern Basin identified 12 priority sites within four sub-catchments. These structures were identified as priority sites due to their impact on migrating fish fauna, their potential benefit-cost ratio, and the river length that would be reinstated should the fish passage be provided at the site. Of the 12 priority weir sites identified, five were investigated for feasibility of fishway installation and identification of fishway designs that would be directly applicable to five of the other sites plus generic types of weir (e.g. sheet pile with rock-fill face) in the northern Basin. Of the two remaining sites, one has existing detailed design and cost estimates (Bourke Weir), while the second (Chinchilla Weir and gauge) requires further investigations – the costs of which were not possible within the budget for this project. 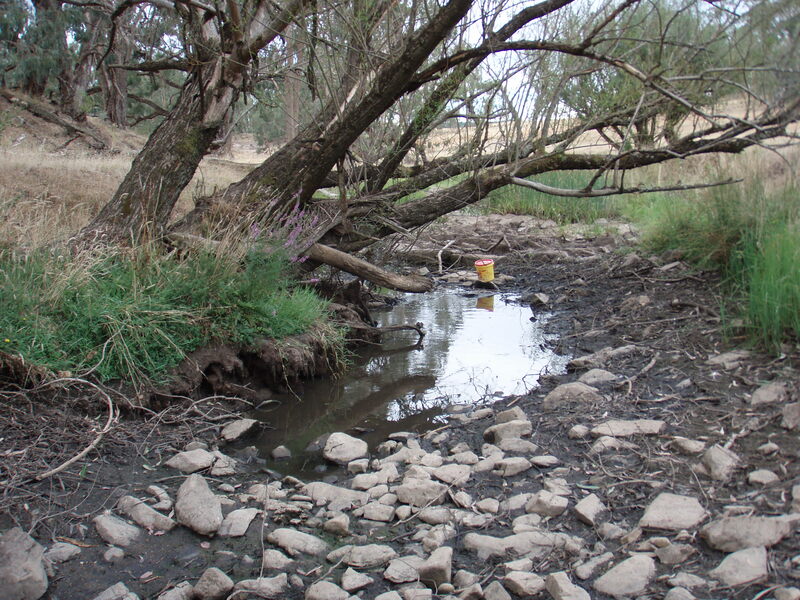 Fishway concept designs were developed at key representative sites which were specifically designed to suit the fish assemblage and semi-arid ecology of the northern Basin. Designs considered constructability, materials, regional context, maintenance and ownership, and allowed the development of cost estimates, with contingencies, to enable the financial and practical scope of the project to be assessed. Findings: The river reaches where the weirs are located were noted to have high ecological value, with known native fish populations, high quality fish habitat, and long river reaches that would be reinstated for migration, either because of few nearby barriers or because of nearby weirs with fishways. Spanning river systems in both NSW and Queensland, 12 high priority sites were identified, together with concept designs and investment costs to fix the top five barriers to fish passage. These weirs were chosen because of their anticipated high benefit/cost ratio. provide fish passage at the top 11 priority structures to reinstate 2,086 km of river channel. The total cost was estimated at $14.56 m.
provide a strategic, holistic, program re-establishing broad-scale river connectivity of over 3,242 km. The total cost was estimated to be approximately $70 m.
the main-stem barriers are not numerous (42 for a broad-scale program reinstating over 3,200 km of river). most of the barriers are low-level weirs between 1.5 m and 4.5 m high, with the exception of only eight structures. most of the sites are relatively easy to work with. Lessons learned and future directions: This project has provided a clear direction for strategic investment to deliver substantial improvements in fish passage connectivity, reducing fragmentation of fish populations in the northern Murray-Darling Basin. 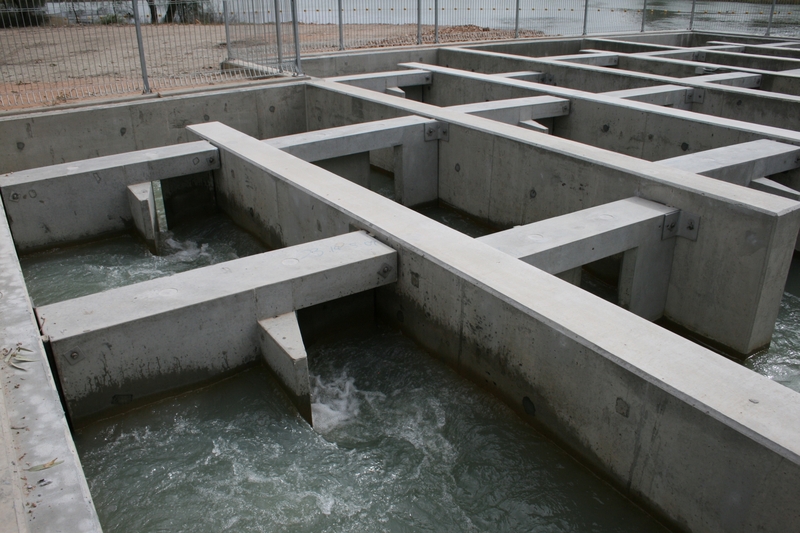 Fishway concepts were specifically designed to suit the fish assemblage and semi-arid ecology of the northern Basin and considered the feasibility of construction, materials, regional context, maintenance and ownership. Key words: split beam, hydroacoustics, sound waves, fish counting, fish migration. Understanding how effective a new fishway is at providing passage for migratory fish is an important part of the design process. Most methods for sampling fish communities to understand movement rely on capture-based methods, which have issues with affecting fishes behaviour and thus biasing the results. Remote monitoring that is not based on capture removes such bias. 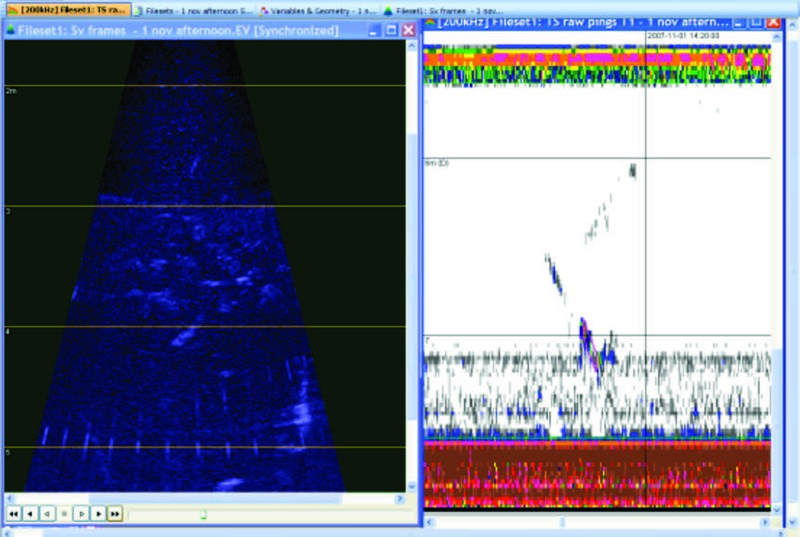 Hydroacoustics (underwater sound waves) is one method of monitoring fish migration. 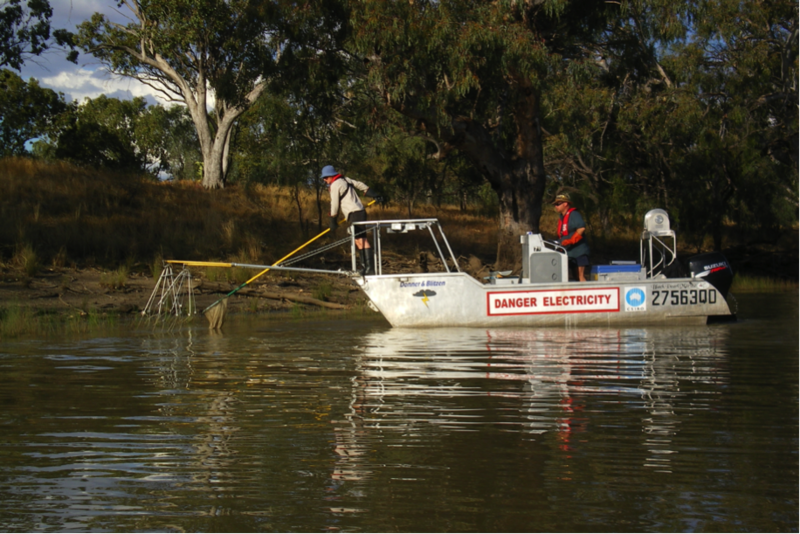 Project aim and methods: This project aimed to investigate a hydroacoustic method for counting fish migrating at the Murray River fishways. 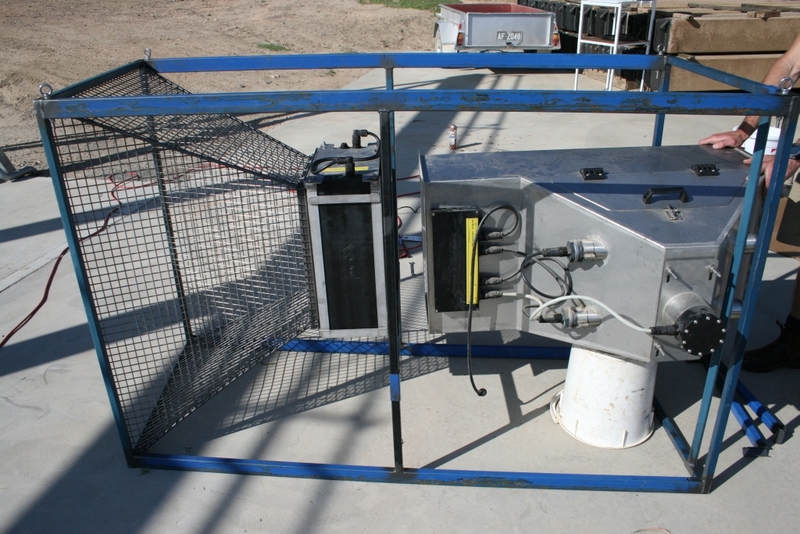 A 200 kHz split-beam hydroacoustic system was installed at the Lock 10 fishway in November 2007 to detect fish moving through the fishway exit channel. 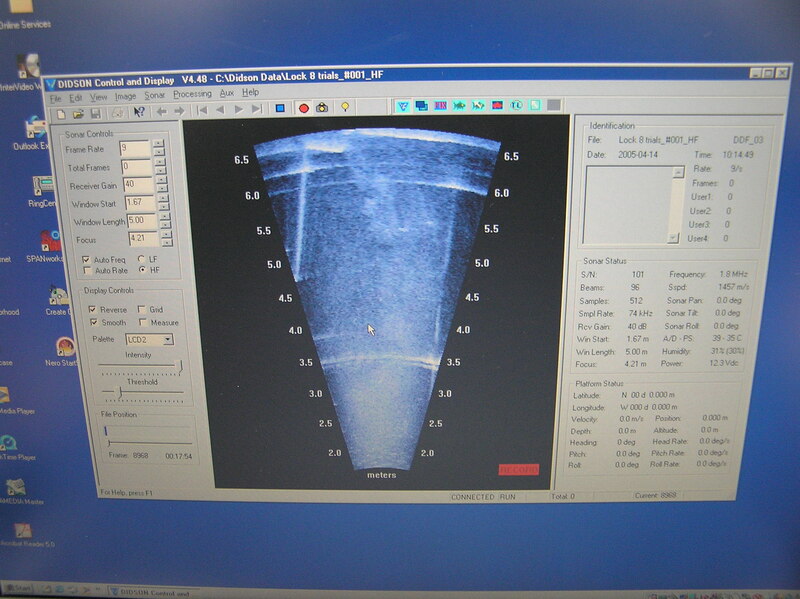 A dual-frequency identification sonar (DIDSON) acoustic system was also installed to provide video-quality images able to be used as a comparison with the split-beam acoustic data. Findings: The DIDSON system appeared to have several advantages over the split-beam system, but both were suggested to have merits for fish counting. 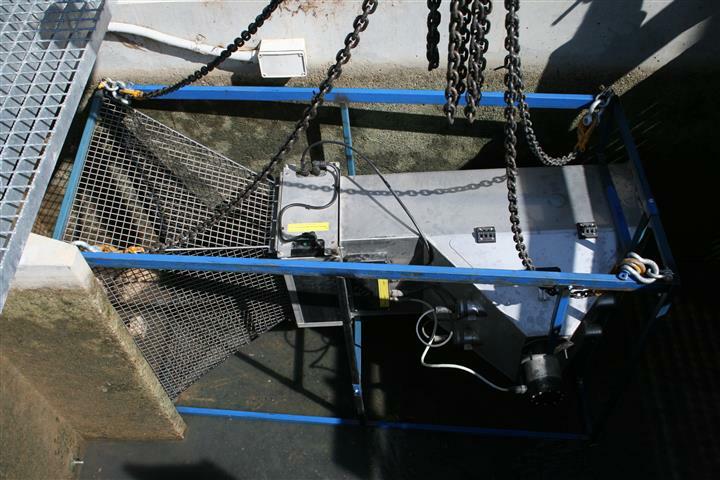 The split-beam hydroacoustic system gave an automated fish count of up to 3.96 fish per minute moving through the fishway, but verification using the DIDSON indicated that nearly half of these fish were not detected. Data from the DIDSON system were also analysed, and an automatic fish count of up to 1.09 fish per minute was established. Visual verification over the same one-hour portion as the split-beam data found that over twenty five percent of fish recorded by the DIDSON system were not detected. Automatic fish length detection consistently underestimated fish length, most likely due to the poor orientation of fish to the acoustic beams. However there did appear to be some relationship between acoustic target strength of fish detected with the split beam acoustic system and fish size, suggesting that this may require further investigation. The DIDSON appeared to provide fairly accurate fish measurement of fish and ongoing data collection and analysis may further improve estimates. The project highlighted a major limitation of hydroacoustics, being an inability to discriminate between fish species, though it was noted that further experiments might assist in species recognition. Low rates of fish migration and reduced river levels precluded the ongoing collection of data beyond the initial sampling period. Lessons learned and future directions: The current study found that despite some limitations, use of hydroacoustics may assist in assessing migrating fish at man-made barriers, and assist in informing future fishway designs, which will have follow on benefits for the long term recovery. Contact: Andrew Berghuis, Aquatic Biopassage Services, 0407 559 908, andrew@aquaticbiopassage.com.au. Native fish species move along rivers for breeding, dispersal, to access habitat, escape threats and establish new territories. In 2001 the then Murray-Darling Basin Commission approved the construction of fishways (Figs 1 and 2) on all of the Locks and Barrages from Hume Dam to the mouth of the River Murray, thus ensuring continuous fish passage for 2,225 km. It was also vital to undertake monitoring at appropriate scales to determine whether constructed fishways were successfully restoring connectivity along the river for native fish species. Are the fishways allowing passage of a full range of size classes and species of fish? Are the fishways reducing accumulations of fish downstream of the barrier? Are the fishways contributing to positive changes in the abundance and diversity of native fish in the river? Are the location, design and operation of the fishways optimised? To answer these questions, two types of monitoring were performed – compliance monitoring to see if each fishway was working optimally and long-term monitoring to see if the fishway program was having a positive impact on native fish populations. Electrofishing and fishway trapping were used to sample fish communities and determine whether they were successfully ascending fishways. Sampled fish were identified and counted, and subsamples measured to enable species/size-specific trends to be identified. Environmental variables such as water temperature, river flow etc. were also recorded for analysis. 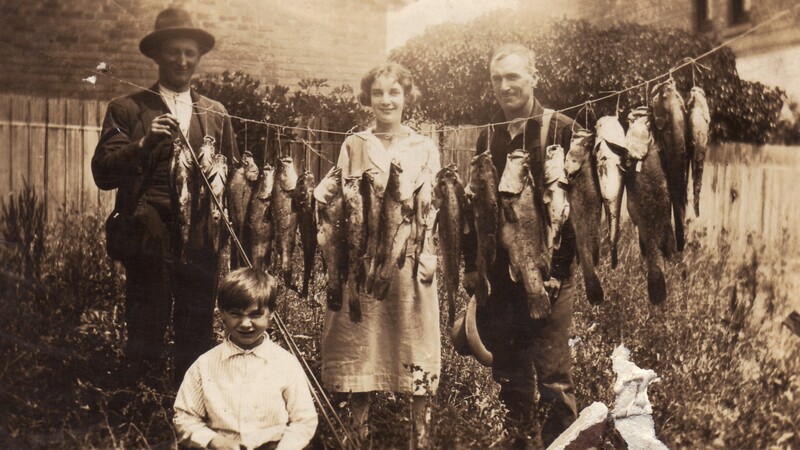 From sampling at Lock 8, the original aim for the passage of all fish, for each species, from a minimum of 31 mm long, all medium sized fish from 90 to 600 mm long, and adult Murray Cod (Macculochella peelii) to a maximum of 1000 mm long, was achieved. Young-of-year (less than 1 year old) Bony Herring (Nematalosa erebi), and the juvenile size classes of Un-specked Hardyhead (Craterocephalus stercusmuscarum), Murray Rainbowfish (Melanotaenia fluviatilis) and Australian Smelt (Retropinna semonii) were unable to ascend the fishway. 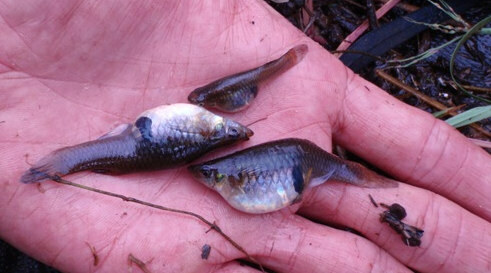 several species smaller than the minimum target design size (40 mm), such as Carp Gudgeon (Hypseleotris spp. ), Murray Rainbowfish and Unspecked Hardyhead, previously thought not to be migratory were, in their thousands, unsuccessfully attempting to gain upstream passage through the fishways. Small-bodied fishes numerically dominated the total catch at the Lock 8 fishway and during spring and summer the bulk of these were juveniles and young-of-year. This highlights a need for an additional fishway design criterion that includes seasonal changes in fish sizes and migratory biomass, rather than simply aiming to pass a minimum length criterion alone. At Lock 8 few non-native fish species were captured in the fishway, with the exception of adult Carp (Cyprinus carpio), which had an 87% success rate of negotiating the fishway. Although the new vertical slot fishways at Locks 7, 9 and 10 performed to design specifications, there were species-specific variations in the minimum size of successfully ascending fish. In particular, many smaller Bony Herring and Golden Perch (Macquaria ambigua) could not negotiate the fishways. 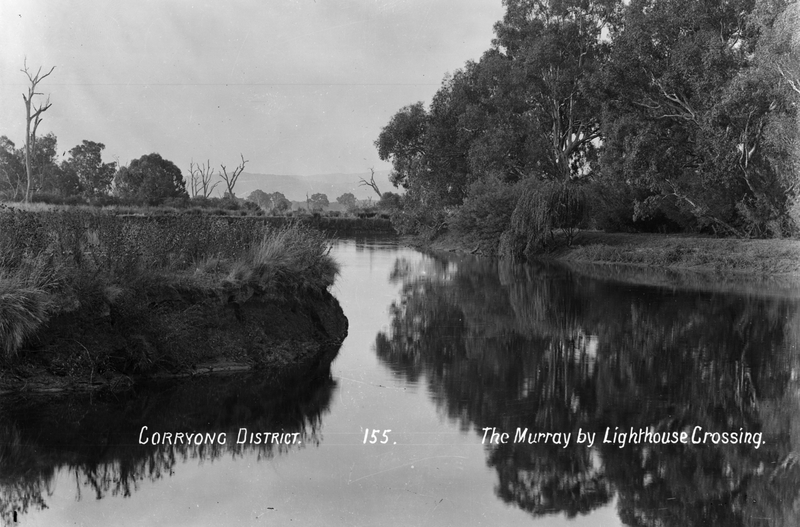 At fishways constructed at the Barrages at the mouth of the Murray, over 98% of fish collected were small-bodied species which were attempting to use the fishways but were unsuccessful due to the design hydraulics, particularly at the vertical-slot fishways. Nevertheless, some small-bodied species were observed using the fishways during periods of low flow between the Lower Lakes and Coorong. Large-bodied estuarine species such as Black Bream (Acanthopagrus butcherii), Mulloway (Argyrosomus japonicas) and various species of Mullet were noticeably absent from the fishways but were present in the vicinity of the Barrages. A large-scale acoustic tracking program was initiated to determine fish passage success for these species. 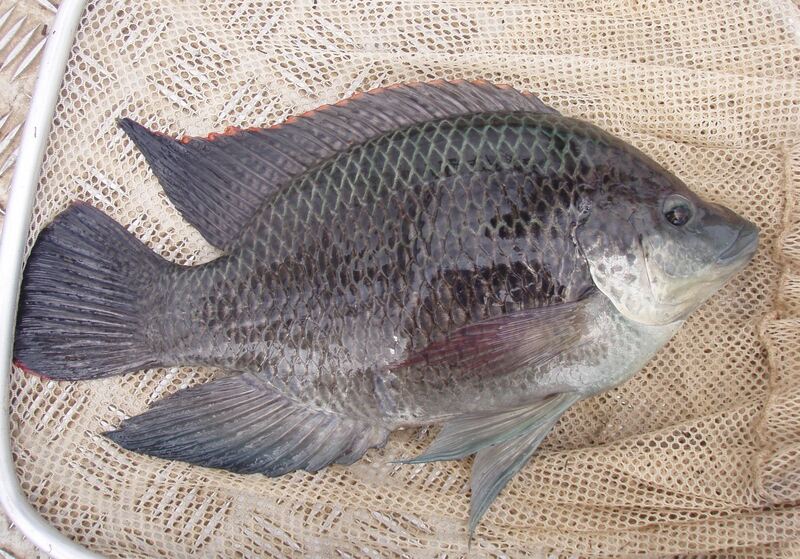 Catches were dominated mostly by small and medium bodied species during low flow conditions. 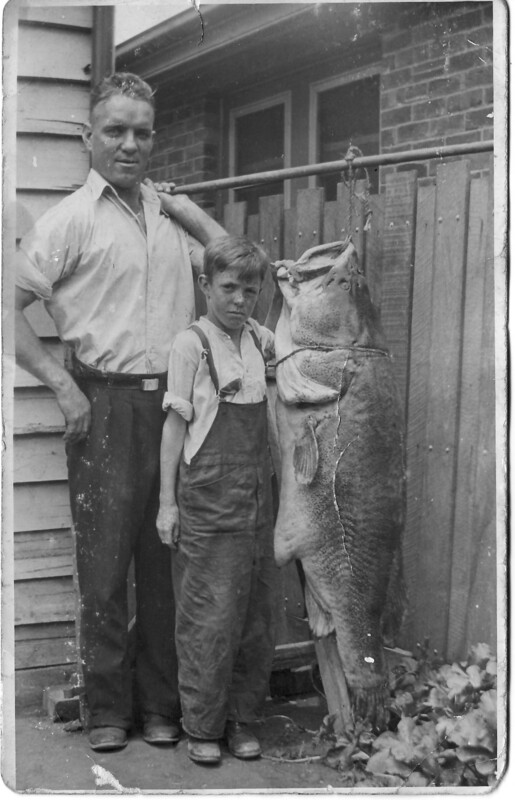 Murray Cod were rarely encountered but the captured population was dominated by large individuals, suggesting that recruitment (survival of fishes from eggs to reproductive stage) opportunities for this species in the lower reaches of the River may be limited. Surveys consistently showed large downstream aggregations of fish, dominated by small-bodied native fish and Carp. Australian Smelt, Bony Herring, Flat-headed Gudgeon (Philypnodon grandiceps), Unspecked Hardyhead, Murray Rainbowfish and Carp Gudgeon remain common in the main channel of the lower River Murray. Differences were observed in the diel (daytime vs night-time) composition of the fish community. Some species and sizes were moving exclusively at night. 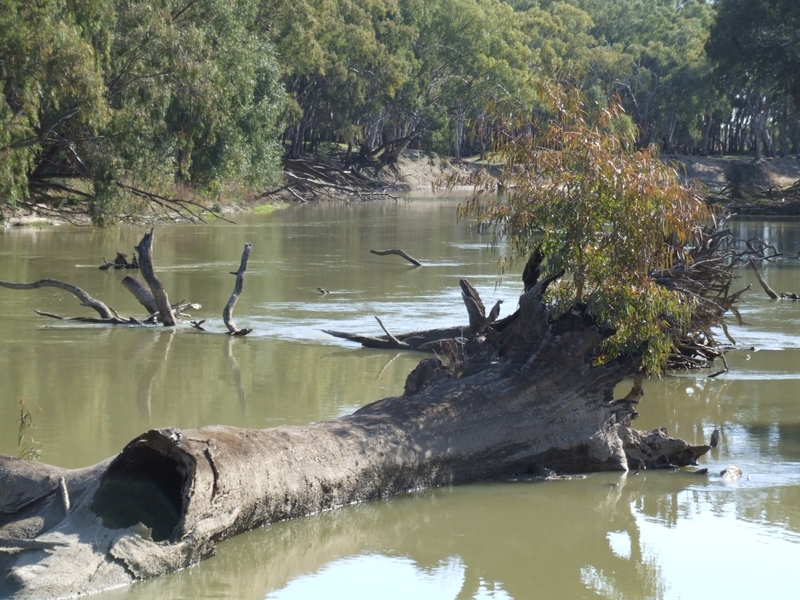 Lessons learned and future directions: While many overseas fishways are designed to pass only a few large-bodied economically important fish species, the Murray River fishways are able to restore passage for the majority of migratory species. The attempted upstream movement of small-bodied threatened species such as Carp Gudgeons, Murray Rainbowfish and Unspecked Hardyhead was not known before the ‘Sea to Hume’ program, highlighting the need to identify the migratory community prior to fishway construction. The subsequent passage of Carp Gudgeons through modified fishways will assist in restoring the ecological processes of dispersal and recolonisation for this species. At the Barrages, fishway types identified as being suitable to facilitate small-bodied fish passage include small fish locks (mechanical elevator-style fishways), low-head vertical-slot fishways (which use a sequence of pools and baffles to control water depth and velocity) and rock-ramp fishways (which are more natural looking fishway designs constructed of rock in such a way as to create a sequence of pools separated by rocky ridges to control flow). To be effective and efficient at facilitating the passage of small-bodied fish over a long migration season (potentially August to March) these fishways will need to operate over a broad range of flow and headloss conditions. Securing environmental water allocations and delivering these in a manner that resembles natural seasonal cycles will potentially deliver the greatest ecological benefit. has important implications for future fish passage studies: both day and night samples are required to adequately describe the migratory community. Remote passive integrated transponder (PIT) tag reader systems, which have been installed at most of the new fishways, continually monitor for any of the 30,000 fish PIT tagged in the Murray River. Upon completion of the program a tagged fish can now be tracked up and down the River for its whole lifetime, providing important ecological data and also offering community stakeholders the opportunity to be involved in the program. Restoring fish migration in over 2000 km of river is likely to have flow-on benefits. These will maximise the potential success of other management practices such as habitat restoration and threatened species protection for the rehabilitation of native fish populations in the Murray-Darling Basin.